I don’t like to kick a man (or an airline) when he’s (or it’s) down, and despite a couple of good quarters, Malaysia Airlines (MAS) is certainly down. The good quarters (following six straight quarters of losses) are a result of increased revenues thanks to better load factors and higher RASK (Revenue per available seat kilometer). Just to recap, to avoid bankruptcy, MAS embarked on a massive restructuring plan towards the end of 2011 that included cutting unprofitable routes and reducing costs with the goal being to return to full year profitability in 2013. Although the airline has done quite well, that’s unlikely to happen even though it is focusing on Asia and has stopped flying to costly destinations such as Buenos Aires, Johannesburg, Cape Town and oddly, Dubai. Giving up Dubai and Dammam suggests the carrier is surrendering to the aggressive carriers from the Middle East. The most recent business strategy announced two key strategic elements – one to focus on the premium sector and the other to focus on the competitive Asian market. The announcement that the airline would go after the premium sector came at the same time as the partnership deal with AirAsia that has now been scrapped. I’ve seen nothing to suggest the airline is courting premium customers and although it is good to see the airline understands the importance of segmentation, I doubt their ability to execute such a strategy. Especially as the airline seems to be going the same old predictable route of using an advertising campaign featuring an irritating tagline (more on that later) to magically increase demand. And I’ve seen nothing else to suggest the airline is doing anything other than the usual advertising, print and PR tactics with a nod to social media. And what an advertising campaign it is! I think this is the TV commercial. I’m sorry but this has to be the worst commercial or video I’ve ever seen. It features people of various ages walking, cycling, swimming, jogging, directing traffic (I’m serious), reading newspapers, skateboarding, going to a meeting, graduating, bowling, clubbing and all with one thing in common – they are all carrying at least one suitcase! Yes, even the traffic policeman!! This really is rock bottom. 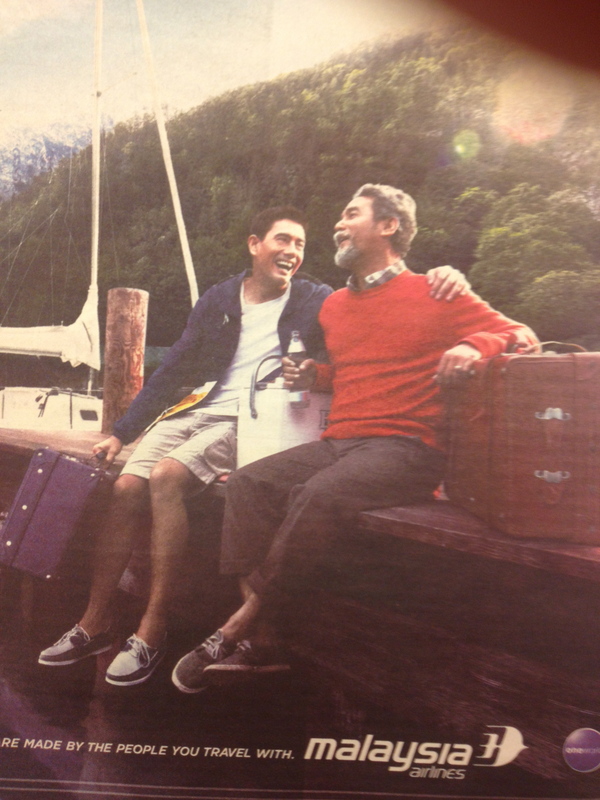 The print advertisement (which I’ve also seen on a billboard) features two men sitting on a wooden dock. They are both holding suitcases and the younger man has his arm around the older man and is looking into his eyes. Does this image make anyone else uncomfortable? Here’s a close up to help you decide. MAS also has a corporate video that starts off with a series of stock scenes featuring babies taking their first steps, dad playing with son, climbers etc and then cuts to old shots of MAS in the early days. Meanwhile the voice over tells us that life is made up of countless journeys. Getit?. Then we get shots of computer generated imagery of the various planes used by the airline from past to present (didn’t BA do something similar?) before going back to the people shots – nice, smiling, friendly air hostess with kid – cut to boys jumping into lake – then back to nice, smiling people, tender, caring hostess and then, out of the blue we’re told the strangers we meet on our journeys give us courage – cut to skydivers – then back to lovers on beach, cultural harmony, pregnant couple and so on. I stopped at this point, unable to continue. Have a look instead. One of the videos (I can’t remember which one and I have no intention of watching them again) features the Malaysia Airlines app that I really like but isn’t integrated with the website (or if it is I can’t figure out how to find my bookings made online on the app). So if MAS is serious about increasing market share, what should the company do? Here are 5 things they need to start doing today. 1) Forget about the big idea. Focus instead on consistent, onging, personalised engagement with each of your very diverse audiences. 2) You probably have one of the most comprehensive databases in South East Asia. Start to use it properly. 3) Focus. These ‘one-size-fits-all’ advertising campaigns are an expensive exercise in naïve futility. Put an end to them now. 4) Don’t do social, be social. 5) Integrate all your solutions to make it easier for consumers to use them. Otherwise they defeat the object of developing them in the first place! I’ve been flying MAS for over 20 years and I think it is a great product but it needs work. A lot of work. This traditional approach to brand building is not going to help steer the airline to full year profitability. They’d be better off throwing the money down a black hole. Solid article Marcus – thanks. I agree with your recommendations. I watched the ad from a set of unbiased eyes… and I must say if this ad were focused on economy class passengers then it really hit the mark… However based on your comments I understand this is not the case (no pun intended). I’m surprised you think that ‘if this ad is focussed on economy class passengers it really hit the mark.’ For one thing, how many economy class passengers travelling alone, catch a black cab to the airport? But I do like the pun! The issue I have is not about the execution which is, as you would expect, very good. My issue is on these levels, the first is that MAS is wasting money using tactics that were relevant 30 years ago but not today – the ‘one-size-fits-all’ mass market approach that tries to talk to everyone at the same time in the hope that some of it will stick. This model is outdated and it is virtually impossible to stand out above the noise for long enough to be effective. The second issue I have is that this approach is also irrelevant because every legacy carrier operating today, with a few exceptions ticks all the basic boxes – heritage, safety, modern fleet, comfort, service, network, alliance membership and reliability. So why go on about them? But most important of all, consumers don’t approach travel the same way anymore. Since the proliferation of low cost carriers that don’t forget still have to abide by the same DCA rules or they won’t get a license, legacy carriers have struggled to build market share. One of the reasons for this is that on the whole, the airline is no longer a factor when making travel decisions. It’s the destination first and then the carrier. MAS needs to get its act together and start engaging multiple segments on a micro level if it wants to increase market share and stop being lazy and trying to get advertising to do the heavy lifting because it won’t work. I don’t know if MAS’s diluted image comes from as much of a “one size fits all”, as you said, as it does from a “poorly executed patchwork quilt” approach, trying to combine facets that have been successful elsewhere, though no matter how you look at it, the approach is, I agree, futile. Before MAS caters to subsets of its customer base, as I acknowledge it should, it does, I think, need a strong and direct image to present to customers. How the parts of this image work for different customers is a separate matter, but I would posit that they all should have a very clear MAS image in common, which they do not have now. Thanks for dropping by and commenting and for sort of agreeing with me! Are you suggesting that the ad campaigns above were created to build a ‘strong and direct’ image for MAS? I interpreted it differently and believe the airline is trying to sell itself. I believe these campaigns are a mass economy approach that attempts to sell the airline to anyone. It’s a classic, old fashioned, lazy approach to sales that has no hope of working, especially in the social economy and in the face of new purchasing mentalities of consumers. As for the imagery, it is quite frankly cringingly awful and will do nothing to build a positive image for the brand. Don’t get me wrong, the ad is awful and uninspired, though I think we’re both right: MAS is trying to build an image to sell itself. For instance, I’m a leisure traveler and you’re a business traveler, but, to some degree, we both probably associate Lufthansa with German efficiency/engineering and a sort of cold luxury. Singapore airlines, no matter the traveler, is known for giving a luxurious and hospitable journey with some Southeast Asian flair. My point is that no such correlation springs to mind when MAS is mentioned and, to be successful, they need to choose such an image and stick to it. Key to building a successful brand are the ability to deliver value. And experiential value is one of the three key elements required to build a brand. The other two being economic and emotional value. The airlines you mention deliver such value in spades. In other words they deliver on promises made and those promises were easy to measure, from the users perspective. We both agree that the latest campaign from MAS is utter nonsense and does little to build such an image or sell the airline. It’s creativity for creativity’s sake. In six months it’ll be totally forgotten but at least the marketing department can say it spent its budget and blame the agency. MAS continues to do this whilst ignoring or not focussing enough on the areas that really matter. As an example, in early July I flew MAS to London in economy and back to KL on business. My expectations for economy were essentially met (although it could do so much more and better things to sell itself to those customers) but were not for business. There is so much room for improvement here but MAS seems unwilling to invest in the experience. It seems to me to simply ‘go through the motions’ to do the bare minimum. It wasn’t that business class was bad, far from it and the cabin crew were very good but it wasn’t anything special. And to really be able to deliver experiential value, that can help MAS compete with regional competitors – SQ, Thai and CX – MAS has to under promise and over deliver and then engage through social media and directly with customers to build the reputation. As an example, on a personal note I’ve been flying MAS for over 20 years. I’ve been a member of their FFP for at least 15 years. My wife is a member as are my 3 children. In the last 5 years, my wife and I have been bumped up from blue members to silver to gold and back to blue and back up to silver and for me, back to blue. Correspondence at all times is formal and standard with no hint of emotion or empathy and with limited personalisation. And despite the various ages of my family, we all receive the same newsletters and other correspondence. 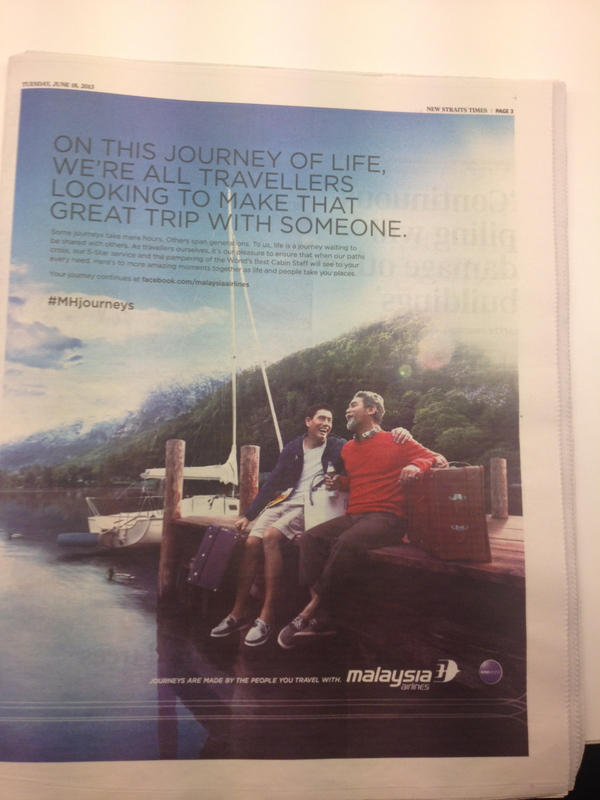 If MAS really wants to be a global airline of repute it will not achieve it using such terrible advertising. It will be by understanding and knowing its customers and building relationships with them. It will require investments in the brand and communications that resonate with target markets. It will require segmentation and personalisation and not just mass advertising. It definitely makes more sense when you put it that way. From your personal experiences, it seems that, far from being ready to create an experiential value, MAS still struggles in providing the services that even allow that to happen in the first place. With that in mind, I’d tend to agree with your view on personalization, especially in regards to where MAS is as a company right now. It’s always the details that matter so I think MAS needs to concentrate on the details-all of them in all facets of their organization-and then see where that takes them. Glad to reach a consensus; I appreciate you taking the time to respond to my comments! I appreciate you dropping by my blog and commenting, I’ve enjoyed the discussion. The organisation is the brand. Elements of the brand are working well but you can’t build a brand with snazzy advertising when the left hand doesn’t know what the right hand is doing! Not sure a gay couple on a dock is the right way to go. Anwar etc. I presume you are saying they look gay and if I’m right, you are not the first person to say that. I really think it is a dreadful piece of work and a complete waste of money. And now after the tragic recent events, irrelevant. « Can you afford to turn away business?